The Taiwanese digital artist Po-Chih Huang and 2013 winner of the prestigious Taipei Arts Awards Grand Prize has turned his hand to beauty for a limited edition line of Facial Treatment Essence bottles for SK-II. Capturing the beauty and vitality of flowers through transformation, the collection celebrates everlasting beauty as a tribute to Pitera’s transformative power. Discover the language of flowers. For the woman who pursues excellence and lives life to the fullest, in this design, Facial Treatment Essence is invigorated with a lively bloom of tulips that symbolize vitality and dynamism. Petals adorn the bottle in bold, energetic red strokes – the very expression of a woman’s passion. The warm yellow hues of the freesia dress up the bottle in this rendition of the Facial Treatment Essence. Exquisitely beautiful, the freesia’s subtle scent and graceful appearance are the perfect metaphor for a woman’s elegance. Selected for its symbolic representation of appreciation and gratitude, the enchantingly captivating hydrangea is stamped onto the Facial Treatment Essence bottle. The soft budding petals coupled with slight variations of colours add an air of mystery to the design, the best gift for a thoughtful friend who always has you in her mind. Deep-rooted in strength and eternity, the green cypress climbs stylishly around the bottle in this limited edition SK-II MEN Facial Treatment Essence. The intricate pattern of overlapping leaves forms a thoughtful and cool image, making this the ultimate gift of wisdom for the man in your life. The limited edition Facial Treatment Essence is available while stocks last at all SK-II counters in Malaysia from 1 October 2014. 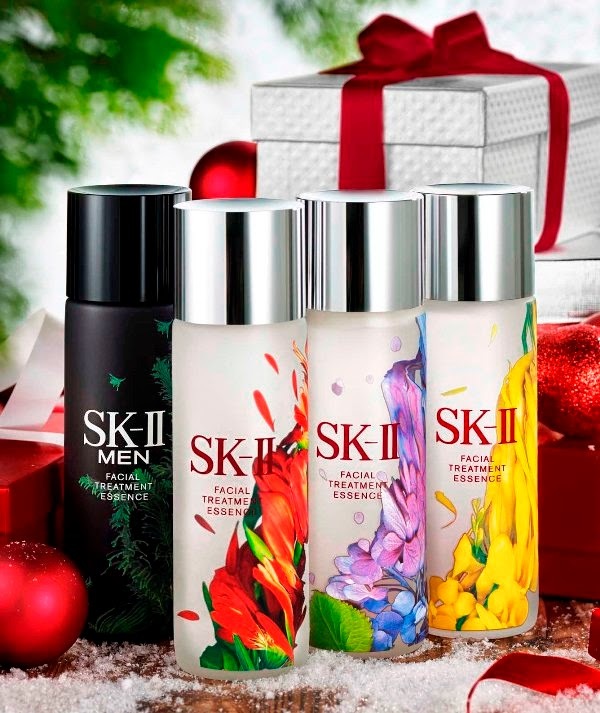 SK-II Limited Edition Facial Treatment Essence, 215 ml is available as part of 4 SK-II festive sets, namely SK-II Miracle In A Bottle Set (RM565), SK-II Best Essential Set (RM974), SK-II Revival Deluxe Set (RM1,094) and SK-II Aura Glow Set (RM1,310). SK-II MEN Limited Edition Facial Treatment Essence, 215 ml is available as part of the SK-II MEN Essential Set (RM784).